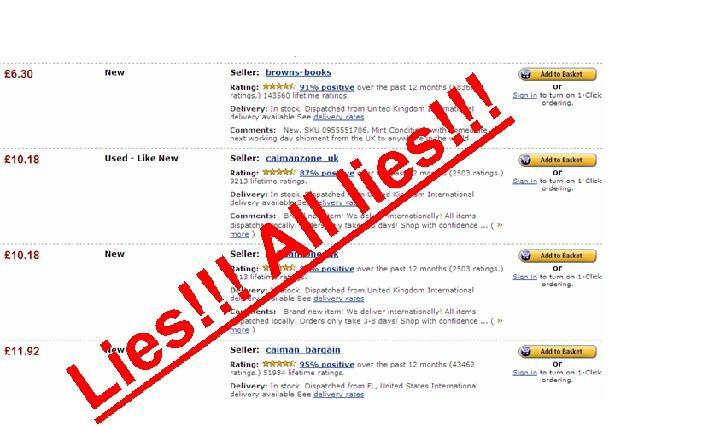 Amazon / Amanidiot – And the award for overlooking the blindingly obvious goes to….me! Quite a large number of people seem to be reading this blog between 1 and 4 o’clock in the morning. Either I’m cultivated a following amongst the insomniac community, or else it’s being read outside of Blighty. I’d previously restricted the amazon settings so that The Melting Pot was only available in the UK; the thinking being that no one would pay the international postage. It didn’t occur to me that it cost nothing to set up and hugely increased my potental customer-base (fool). This has now been rectified. …A number of people have been kind enough to look me up on the Facebook application i-Read which allows you to ‘chuck’ a book at your friends with a recommendation. If you’re a facebook user and liked the book please seek me out (The Melting Pot can be found in the international search). It’s for a good cause*. (*The previous sentence can’t really be substantiated). Moral-bending – Staying on a Facebook theme, it was suggested that I find people with the same names as famous authors or movie stars and then ask them to write reviews of the book – Couldn’t find a ‘Meryl Streep’ for love or money, but did find a great many ‘Michael Boltons’ and ‘Peter Stringfellows’ – proof if ever it was needed that there is something fundamentally wrong with the world! Wrote to a few ‘Janet Jacksons,’ ‘James Bonds’ and ‘Harvey Keitels’ without success before the same person who’d originally suggested the idea added that it was somewhat deceitful. Not content with charging double the going rate without actually possessing any copies, ‘Caiman Bargain’ have waded into the fray promising to dispatch the book from Florida! They also offer it at £1.30 and £5.19 more than I do! A double-whammy of disappointment. Back at home I set about assembling the bits and pieces into a makeshift creature -‘the vicious circle.’ As I did so I thought about all the normal people out their going for meals with their friends or watching TV. My abomination completed I went to bed, leaving its limbs balanced on cups while the glue dried. 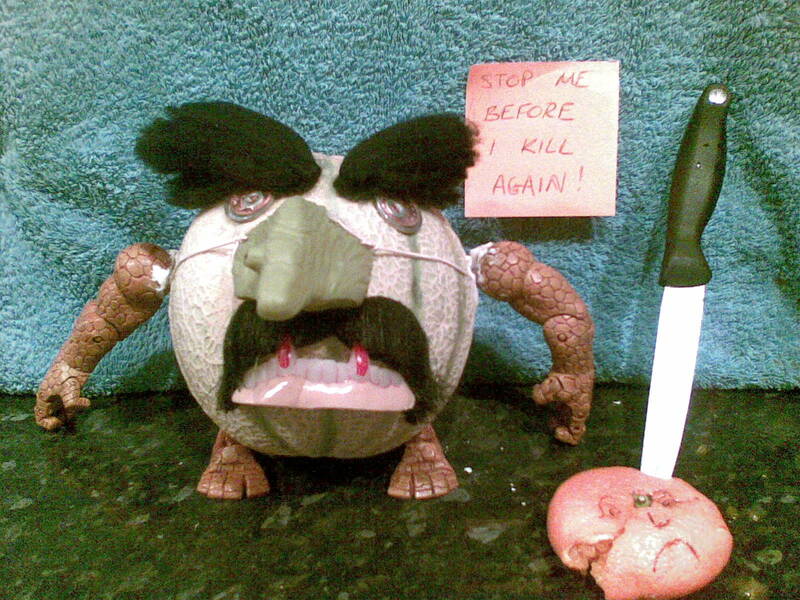 …Had a bit of a mishap with the melon, resulting in the loss of a limb, which then had to be strategically placed giving the monster an unfortunate nonchalant pose (not a good look for a monster). Next came the problem of lighting – too much sun – couldn’t see the wall-writing. The problem was solved by dragging a table into the garden and draping towels over it to project a shadow. With conditions finally right I took a million photos, chose up and put it on the header above. The closing date for entries to the BBC short story competition is about to expire. I had my submission ready – ‘Method Acting’ – a story about a man who gets the starring role in a Broadway play and becomes so immersed in the character that he loses his sense of self. Just before posting it I read the small print and discovered that you had to be previously published, and that self-publishing didn’t count. I thought about writing a strong letter of complaint to Henry Kelly, but then reasoned that one 15 minute interview several months back probably doesn’t constitute an unbreakable sacred bond. As stated in a previous blog – I don’t feel hard done by with the stigma that seems to be attached to independent/self-publishing, but it’s still worth mentioning whenever doors remain closed to me as it’s all part of the journey. On the 5th of next month I’m heading up to ‘The Flask’ pub in Hampstead to take part in a reading group’s discussion about The Melting Pot (6-8 people) – quietly excited whilst mildly petrified at the prospect of meeting readers in the flesh, but then as I keep telling myself – why else did you get it published! I’ve also started to approach reading groups outside of the London / M4 corridor. My initial thoughts were that people would be more open to taking on a book by someone who was vaguely local, but emboldened by a few successes I’ve decided to branch out a bit. At parties, when asked what I do for a living, I’ve been known to introduce myself as a wizard. The reason for this can be traced back to twelve years ago at university where an accountancy degree made it difficult to impress women. Apparently she’d heard that one before and successfully avoided my feeble trap; disappearing off with a guy who manages hedge-funds-stock-portfolios or something. Being free from the constraints of convention is a wondrous thing – A lot like telesales, but with the added benefit that you can also see your recipient’s eyes glazing over. Being approached to take part in a literary festival (London-based) – Faaaannnnttttaassstttiiccc! A third reading group has taken me on. Gorgeous women stop you in the street and ask if you wouldn’t mind signing their underwear. Burly Italian waiters wave you past a queue of irate customers, turf a couple of supermodels out of their seats, present you with a bottle of their finest plonk, (on the house naturally), and then hang off your every word, (along with the gathering crowd), as you regale them with hilarious anecdotes about your various famous friends. Complete strangers come up to you at the bar and adorn you with cigars and brandy before kissing you on each cheek and sobbing at just how great you are. You find your book in Oxfam. Inspirational writing has been somewhat curtailed in recent weeks due to my hands no longer working. This in turn is as a result of spending the winter months huddled around a portable heater. Whilst I would love to cry Dickens-style poverty, my predicament is in fact caused by a series of rogue heating specialists dis-improving my ancient combi-boiler (‘Oops…now that’s broken’ etc).